Another inkjet all in one from Canon, the Pixma MP970, aims to be a device suitable for small offices, homes, and institutions with good photo printing requirements. It is not a very compact unit like most other inkjet all-in-ones. Canon Pixma MP970 main function is that of photo printing, as such it offers very good print quality with a resolution of up to 2400 dpi. Unlike other inkjets, the Canon Pixma MP970 Ink Cartridges also have light cyan and light magenta which help in getting true to life colour prints. The optical scan resolution is a high 4800 x 9600 dpi, but the scan quality is still not up to the usual quality that we expect from Canon. The print speeds range from 1.7 ppm for photo prints and 20 ppm for colour prints to 30 ppm for black and white prints. The printer has 2 trays of 150 pages each, one in the rear and another regular paper tray, though there is no automatic document feeder for single prints of special type or size of paper. Other than the usual supported paper types, this printer also supports CD labels, print on transfers and CD jewel case inserts. Another standout feature is that it can scan a 35mm film and directly send it for printing photos. Canon Pixma MP970 is primarily meant to be a photo printer, and thus the USB not supporting hard drives or fast drives is little disappointing. Other than that the connectivity options include USB, ethernet, wifi, and the card slot that supports most cards and memory sticks with its 2 card slots and PictBridge USB port. The 7 Canon Pixma MP970 Ink Cartridges with pigment based black and dye based colour cartridges help in giving very good quality black and colour prints. Canon Pixma MP970 is a large inkjet with multiple connectivity options meant to serve the needs of small offices and image intense requirements. With extra colour cartridges and excellent photo prints its does its job very well. However, some weaknesses like a large footprint, lack of duplex printing and no fax support, stop it from becoming a workhorse that would serve a medium office needs comprehensively. Q. 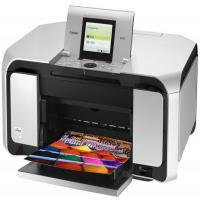 Does the Canon Pixma MP970 printer support WiFi connectivity? A. Unfortunately, the Canon Pixma MP970 printer does not support WiFi connectivity. The only interfaces that it supports are LAN and USB. Q. I recently ordered a pack of Canon Pixma MP970 ink cartridges? How can I track my order? Q. Does the Canon Pixma MP970 printer have an LCD display? A. Yes, this printer has an 3.5" LCD screen. Q. I think that the waste ink absorber of my Canon Pixma MP970 printer is full. What should I do in such a situation? A. The purpose of the waste ink absorber is to safely collect any waste ink expelled during cleaning of the print head and borderless printing on photo printers. Over time this waste ink absorber can become full and will need to be replaced. The replacement of the waste ink absorber needs to be completed by a Canon authorised repair centre, to prevent ink leakage which can cause damage to the printer. Q. How many pages can I expect to print using your compatible Canon Pixma MP970 ink cartridges? Q. I'm currently using original Canon Pixma MP970 ink cartridges but I’m considering using your compatible cartridges instead. Is there any difference in quality between the two? A. Our compatible ink cartridges are rigorously factory tested to the same ISO standard as the original brand ink. They produce the same quality of output as original and are much cheaper! All our ink cartridges come with a money-back guarantee. We recommend that you go for multipack cartridges as they are more economical than individual packs. Q. While taking a print from Canon Pixma MP970, I noticed streaks appearing on the page and the print is broken. Can there be some problem with the ink cartridge? A. Usually if the paper is not aligned properly, it creates the problem of irregular and broken print. This problem can also be caused by printing outside the recommended print area. Make sure to place the paper properly on the print area and use correct paper type. Choose “High or Fine” print quality option for best results. Also, it is advisable to use only high quality compatible ink cartridges other than original Canon Pixma MP970 Ink Cartridges for printing quality images. Q. How can I check the ink level on my Canon Pixma MP970? A. Whenever the level of ink in Canon Pixma MP970 is less or has got exhausted, an error message will be displayed on the printer’s LCD. You will receive a message reading “Low Ink” or “Ink Exhausted” or “Replace cartridge “. You will have to replace the cartridge with a new Canon Pixma MP970 Ink Cartridge. In order to check the level of Ink on Canon Pixma MP970 follow the steps listed below. If there is no sign it means, the printer has sufficient ink left. You can still manage to take few printouts till the ink exists, but we would recommend you to install new Canon Pixma MP970 Ink Cartridges for undisrupted function. Q. Can I use cartridge of some other brand on Canon Pixma MP970 Printer? A. The print head of the printers varies based on the company and brand. Using the cartridge of some other brand may create a defect in the functioning. It is always better to opt for original or compatible Canon Pixma MP970 Ink Cartridges. Good quality compatible ink cartridges are available on our site. Q. When I tried to install the ink cartridge of Canon Pixma MP970, the color started to leak. Suggest me steps for proper installation of cartridge. A. Firstly, it is important to insert the cartridge as soon as it is removed from the cover, otherwise there are chances of the colour getting dried. Keeping it exposed to open air can make the cartridges turn dry. Before installing shake the cartridge well, but do not leave it open for long, this will lead to leaking of colours. In order to install new Canon Pixma MP970 Ink Cartridges follow the steps listed on the manual that you have received with the printer. Before that make sure the cartridge is empty. Step 1: It is important to keep the power ON. Step 2: Canon Pixma MP970 contains two trays. Tray A and Tray B. Open the front cover of Tray A. Tray B is the paper output Tray. NOTE: Make sure to remove any paper that is in the cassette. Any paper left in the cassette will make the procedure more complicated. Step 3: Now, open the paper output cover and wait till the cartridge holder moves to the replacement position. NOTE: Do not forcibly try to stop the cartridge holder until it doesn’t stop completely on its own. Also the cartridge holder may contain some ink left on it. Do not touch it with bare hands and wash off any left out ink with a tissue. Step 4: To remove the cartridge push down the empty cartridge until you hear a click sound. Do not apply force as it may lead to leakage of colours. If the alarm is kept in silent, there won’t be any beep when the cartridge is uninstalled. Step 5: Before installing Canon Pixma MP970 Ink Cartridges, make sure to open the cover and the protective label carefully. Step 6: Now insert the new cartridge at a slant into the cartridge holder at their proper slots. The colour cartridge on the left slot and black on the right. Further push it gently until you hear the click sound. The installation is done.